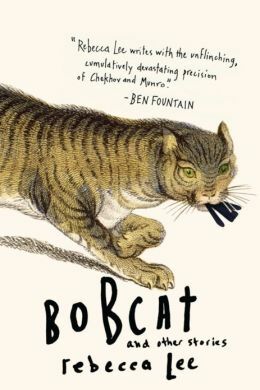 There is something deeply likeable and satisfying about the eight stories in Bobcat and Other Stories, the new collection by Rebecca Lee. Each one is a full landscape peopled by believable characters who stumble along in recognizable ways. Lee takes her time developing the stories and they deliver the more complete satisfactions of longer works. But it’s the writing itself that is the real standout here. Lee writes in a way that is profoundly clear one minute and deeply strange the next, meaning her observations and descriptions can be startlingly unexpected – and they are wonderful for that. In the title story, which takes place at a dinner party, one of the guests tells of being mauled by a bobcat. She was ambushed, her eyes in the wrong place when it happened. The story within the story felt random to me on first read, but of course, it isn’t. The narrator who, with her husband, is hosting the party is ambushed as well and for the same reason: because she, too, is looking in the wrong place. Her eyes are fixed on what she assumes to be the jeopardized marriage of her colleague when it is her own that is really in trouble. Lee’s odd and beautiful imagery is the book’s deepest pleasure. In “The Banks of the Vistula” a student at a small college in Minnesota has plagiarized a paper by copying a chapter from an old, apparently unread book she finds in the school library and is captivated by. Her professor, a Polish national who lived under Soviet occupation, forced to give up his own language and speak Russian during those years, knows she has plagiarized it and also that she has no idea what the chapter really means. He tells her the paper reads like Soviet propaganda. But he exacts no punishment – at least, not until the end when he makes her the keynote speaker at a symposium. Her friends attend, and her proud parents drive down to hear her give the paper. It’s the bewildered reaction of the audience to what clearly is propaganda that becomes her lesson. And the professor is a fully realized, complex character, described as “a big man, his torso an almost perfect square. Behind his balding head the blond architecture of St. Gustav College rose into the cobalt sky. It looked like a rendition of thought itself, rising out of the head in intricate, heartbreaking cornices that became more abstract and complicated as they rose.” That’s a description to make you sit up and pay attention. But when the descriptions aren’t grounded in the concrete, they can be infelicitously vague: “…that window, ringing with clarity and light above the dark grounds, the way the imagination shines above the dark world, as inaccessible as love, even as it casts its light all around.” She’s using concepts to illustrate other concepts, a helix of vagueness. More often, though, the descriptive imagery is not only concrete, it’s clear and startlingly illuminating. In “Fialta,” where a number of architecture students are invited to study with a world-famous architect at Fialta, his home and workplace, the character Sands is described: “Her clothes were as plain as possible and her hair pulled back in a ponytail, all as if she were trying to overcome beauty.” Yes; you can picture exactly what Lee means. It’s a wonderful description – but it’s essentially the same one as of the professor in “The Banks of the Vistula,” earlier in the book. If there is a weakness in this collection, it’s that: repetition, of descriptions (“His cup was full to the brim, and just a little over” appears twice), of the narrators’ voices and of their preoccupations, most strikingly, a love of language and words. Language is clearly important to Lee, and it is to her characters as well. In “The Banks of the Vistula” the linguistic elements make sense: the professor teaches a linguistics course. In “Bobcat,” the narrator is jealous of her writer husband’s relationship with his editor, partly because he and the editor are both in love with words. But the narrator, a lawyer, seems to be equally in love with them, though without it having created a bond between her and her husband, and this was harder to reconcile. The adoration of language infects too many characters; improbably, they quote to one another, or themselves, constantly. Ovid is invoked in two stories; Walter Benjamin, Rilke, Stephen Spender, Elias Canetti, Philip Larkin, Lawrence Durrell, Tony Kushner and Auden all put in appearances. It’s unusual for individuals to walk around with relatively obscure quotes at their fingertips, but in many of the stories here at least one character does it. The collection ends as it began, with a dinner party – though in “Settlers,” the final story, there are several different gatherings involving friends and food. It’s not exactly a story as much as a coda, a way of wrapping up the writer’s thoughts and, perhaps, her life philosophy. There are three couples here, friends, who see each other fairly often: Lesley and Andy, a married couple with three daughters; the narrator, loosely coupled almost all the way through with a single male friend David Booth; and Berber and Bryan, a new couple who marry over the course of the story. At first the “Settlers” of the title seem to be Lesley and Andy, the married-with-children couple, the stable ones, the ones who invite the other less settled friends for dinners. But by the last paragraphs, it’s clear Lee means a different kind of settling. Settlers, it’s now clear, means people who settle – for others, even with their imperfections; for some of what they want, not all. But the last words of the story and the book are imbued with hope, not despair or cynicism: “just keep going,” Lee says. And all these characters do. EDRA ZIESK is a writer living in New York. She's published three novels, The Trespasser, A Cold Spring, and Acceptable Losses, as well as many short stories, and is a recipient of fellowships in fiction from the National Endowment for the Arts and the New York Foundation for the Arts. She is working on a new novel.